I found most of our religious books speak about Lord Vishnu's avatars and there are much fewer books that I know of about Lord Shiva. If Lord Vishnu has 10 avatars then how many avatars do Lord Shiva has? In one of my research I came across a Shiva avatar that I never knew. Sharaba was the name for the Avatar, other name is Gandaberunda, derived from the meaning of a half lion and half bird. sharaba incarnation of Lord Shiva is to tame Narasimha avatar of Lord Vishnu. That is the only line of story I know about Sharaba avatar of Lord shiva. Does any one know beyond this? If you want to learn about the incarnations of Shiva, you can read the Shatarudra Samhita of the Shiva Purana, which mentions numerous incarnations including the following: Vrishabha the bull, whom I discuss in this answer; Virabhadra, the demon created by Shiva to kill Daksha after the death of Shiva's first wife Shakti; Kalabhairava, the demon created by Shiva to cut off Brahma's fifth head; and Sharabha who is the focus of your question. Then in a trice the form of Virabhadra became invisible.... Thereafter [the] middle [of Shiva's splendor] became clearly manifested in the form characteristic of Rudra of deformed shape.... He had a thousand heads and wore matted hair. His head was adorned by the cresecent moon. He appeared like a bird with wings and beak. His body was fierce and fully developed. His fangs were very sharp. Adamantine claws were his weapons. His neck was black in colour. He had huge arms and four legs. He was blazing like fire.... His three eyes were as wide and blazing as the fire of the evil spirit of great fury. His fangs and lips were clearly visible. It was Vishnu alone in the form of Man-lion, haughty and strong, engaged in the activity of annihilating the universe. He shall be prayed and bowed by my devotees aspiring achievements. He is the foremost of my devotees and the granter of boons. After that Sharabha disappears and Virabhadra appears, tearing the hide off of Narasimha's body, which is said to be the hide that Shiva wears. And Narasimha's head becomes one of the skulls in Shiva's necklace. Now the Shiva Purana's account ends with Sharabha simply disappearing after defeating Narasimha, but some versions of the story add a further incident, which is where Gandhaberunda comes into the picture: after Sharabha grabs hold of Narasimha, Narasimha in his fury creates a two-headed bird beast called Gandhaberunda which is even more powerful than Sharabha. Gandhaberunda defeats Sharabha in battle, and then Vishnu and Shiva finally call it a day. Now Gandhaberunda is famous enough that he is depicted in the coat of arms of Karnataka, but I haven't yet found a scriptural basis for his story, which is why I asked this question. 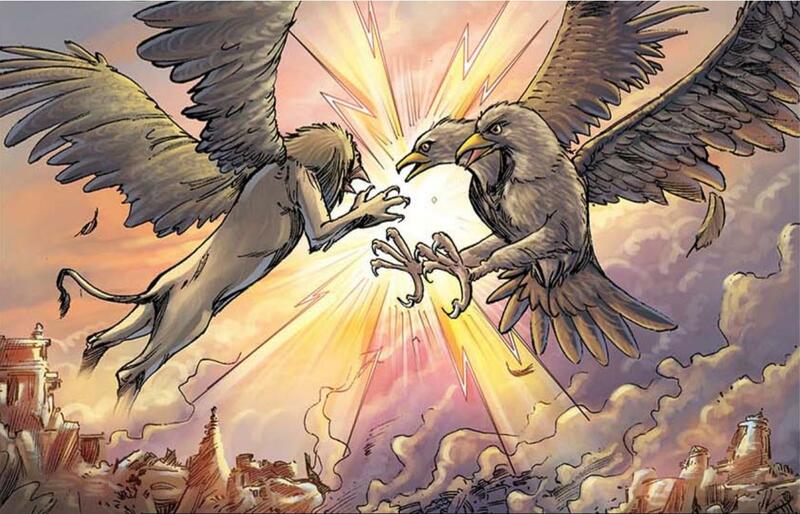 But in the mean time, you read the story of Gandhaberunda and Sharabha in this excerpt from the new Amar Chitra Katha comic "Divine Beings"; the above picture is taken from there. "Ganda Berunda Garva Banga Sharabha; Veera Narashimha Tharpa Vinasaga Sharabha!" The Narashima was half man and half lion incarnation of Lord Vishnu. Narashima tore apart Hiranyakashipu’s belly with sharp nails. The claw is a part of the body that is both living and dead. After he killed Hiranyakashipu, Narashima was still enraged! Brahma sent Prahalada to pray to Vishnu in hope that it would calm him down. Prahalada’s efforts were to no avail. Frightened, all of the gods went to Lord Shiva for help in calming Vishnu. Lord Shiva first sent two of his best earthly men, Bhairav and Veerbhadra, to calm Narashima. Narashima pounced on Veerbhadra when Veerbhadra asked Narashima to calm down nicely. To protect Veerbhadra, Shiva appeared in his most devastating form, Sharabha. It is said to be a giant, frightening, form with thousands of hands. His appearance resembled a huge cannibal bird. Sharabha scratched Narashima with his wings and carried him off into the distance. Vishnu became so scared that he fell unconscious. After he woke up, Vishnu eulogized Lord Shiva, which pleased Shiva. Narasimha is Parabrahman and cannot be overcome by anybody. This story goes against the meaning of the authoritative shAstra. This story is only found in the tAmasa purAnas like shivapurAna, which are fit to be rejected and have been done so by all vedAntins. This great Sarabha, Siva, is said to have been destroyed by Pratyingara devi, when Sarabha was overcome by pride and egogism and started destroying the universe. One can clearly see through, the majestic interpolations in the tamasic and rajasic puranas which talks of Sarabha defeating Narasimha, Sarabha killed by pratyangira.. The idea of one deity progressively suppressing the other only evokes laughter and shows the inherent tAmasatva of these stories. The anger of Narasimha, which persisted after the destruction of Hiranyakasipu, frightened the devas, upon which they approached Shiva and sought his help. Shiva, being flattered by their praises, was overcome by tamOguNa. Although Shiva is a yOgi by nature who is always meditating on Sankarshana (and hence, Narasimha), this time, due to tamO guNa which is vishNu mAyA, his intellect became clouded and he was unable to recognise Narasimha as his own upAsya mUrthy. Thus, he appeared in the form of Sharabha to engage in battle with Bhagavan. Narasimha destroyed Sharabha in battle with his mere nails as he did in the case of Hiranyakasipu. Meaning: Oh bhagavAn (sriman nArAyaNa)! Your mAya indeed benumbs the intellect of all living beings. Did not Shiva who took the form of a strange and mighty animal (supposed to have eight legs and wings) called Sharabha get burnt down in just one small spark of your rage like a moth that perishes in the blaze of fire?? Meaning: Salutations to Narasimha, who is situated in Lakshmi, and plays (?). By whose fire of anger, the body of the ferocious Sharabha was burnt to ashes like a moth perishing in a blaze. The AchAryan here is alluding to the destruction of Sharabha being an effortless act of Narasimha, who is sarvasakta, and tavasastavIya (stronger than the strongest). Here, the quality of agatitagaTanA sAmarthyam (reconciling contradictions) is also seen in BhagavAn Narasimha. While normally a Sharabha is stronger than a Lion, this was a case where a Sharabha was killed by a Lion. This was indeed an astonishing leela of bhagavAn! Meaning: The half-man, half-lion (Narasimha) killed the violent Sharabha who had approached him (for battle) by lacerating Sharabha with his nails in a similar manner as in the case of Hiranyakasipu. Meaning: The two powerful devas - Narasimha and Sharabha, who have no equal in the Universe, fought a prolonged, fierce and violent battle. As a result of that altercation, the large bodied Narasimha (and thus superior in prowess), who possesses terrific valor that controls the asurAs and prevents anything from going against his will (bhIma vikramaH), whose limbs appeared to have a thousand nails (ie, limitless power in his nails) was angered. Being in (that state of) rage, Narasimha, who is terrible to the adharmIs (bhIma) and becomes extremely formidable when the adharmIs continue to remain bent on adharma (ugra), killed Sharabha using his sharp and fierce nails. Sharabha had incited the Slayer of Madhu to wrath and so, the lotus eyed one (pundarIkAksha) was appeased by (the prayers) of the devas and devarishis. “madhusUdhana” – “madhu” refers to rAjO guNa which in turn is the cause for desire, that leads to anger that is tamO guNa. Just as the Lord killed the asura madhu, so did he kill Sharabha who possessed anger born of tamO guNa. “pundarIkAksha” – Since he has lotus like eyes that are reddish due to always looking at the golden complexion of the compassionate srI mahAlakshmi, the Lord is easily assuaged and made peaceful due to the mediatorship of lakshmi. He resurrected Shiva back to life upon the prayers of the devas. Meaning: Chopping off many heads (of Sharabha) with his nails that were equal to adamantine (vajra), Narasimha who towered like Meru (mountain), also (in addition to hiranyakasipu) Killed Sharabha. Meaning:The form of Sharabha had a beak, the face of a lion, with 8 feet and limbs which were a dense black color. It was throbbing with the intensity (of anger), had bloodied hands, with a thousand weapons. Narasimha, acting mercilessly as in the case of hiranyakasipu tore apart with his hands (ie, nails), the beaks on every single one of Sharabha’s faces at their folds. Meaning: Thereupon, in a moment, the sound from Sharabha’s mouth intensified in all directions, approaching vishNu (the all-pervading one) with a terrible roar. Narasimha, having seen that arrival of Sharabha with that (sound), became furious and tore apart Sharabha and disposed it with his nails as he did in the case of Hiranyakasipu. All these clearly shows that Narasimha destroyed Sharabha. The purAnas state further that when Narasimha was appeased by PrahlAda, he resurrected Shiva back to life upon the prayers of pArvati. Therefore, the supremacy of Narasimha alone is seen in this incident. Shiva assumed the form of devastating sharabha for calming down narsimha murthy. When sharabha tried to destroy narsimha, narsimha became even more angry,his fury reached peaks, he created a mystical, ferocious,most powerful God named "gandabherunda"..gandabherunda tore sharabha & shoolini devi(parvati) into parts. Then a new form of goddess lakshmi "pratyangira devi" was able to calm down narsimha. Everyone is answering wrong. I know the actual story of Shiva's avatar Sharabha. When Lord Vishnu's avatar Narasimha who was half man and half lion had killed evil Hiranyakshyap,he became too much angry and he was trying to destroy the world. All Gods and Gods were so much worried about the condition. Lord Shiva took the form of his avatar Sharabha who was half lion and half bird was appeared in front of Narasimha. Then the fight between Lord Narasimha and Lord Sharabha begins. Lord Indra was very worried because he was thinking if something happens to his heaven,the whole world will destroy. Lord Narasimha was defeated by Sharabha and then Sharabha said ''Oh Lord Narayan! Please come back to your original form! You took this Narasimha form for killing Hiranyakashyap and now you have killed him. So,please come back Narayan!''. Then Lord Narasimha had became very calm and he was transformed back into his original form Vishnu. Lord Sharabha too was also transformed back into his original form Shiva. Vishnu told Shiva that his Sharabha avatar will also called 'Sharabheshwara'. Then all Gods and Goddesses were so much happy and gave respect to Lord Shiva and Lord Vishnu. Not the answer you're looking for? Browse other questions tagged mythology shiva vishnu avatars narasimha .